Make a stylish braided cowl in under an hour with this quick and easy free crochet pattern. Done in Super Bulky Yarn, such as Wool Ease from Lion Brand, the braided design makes this cowl a really nice match to pair with these Faux Cable Fingerless Mitts or Arm Warmers. 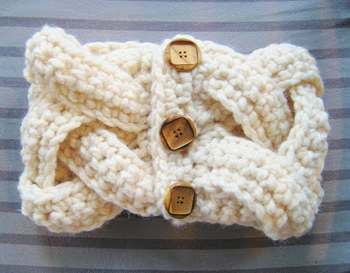 On the original pattern, the buttons on this cowl were only decorative and the cowl was pulled over the head to wear. In this version, the buttons are functional so that you can fasten the cowl around your neck, leaving your hair relatively untouched in the process. The gorgeous wooden buttons shown here came from JoAnn Fabrics. Why not indulge yourself a little here – and use three big, beautiful buttons to accessorize the cowl almost like pieces of jewelry. The crochet pattern uses only single crochet stitches and is a perfect beginner project or quick homemade gift for Christmas or winter birthdays. Constructed in a braided design with four strips, it involves repeating the same two steps and is super easy once you get going on it. Finished size is 23 inches in circumference and 7½ inches wide. Yarn: Super Bulky, size 6 yarn. (i.e. Wool Ease Thick and Quick from Lion Brand). The UK/Australian equivalent is 14 ply. Hook P (10mm) and a hook H (5mm) to weave in the tails. Three large wooden buttons. Buttons shown on design sample are 1¼ inch size. Available as a Free PDF download, or you can view the Alicia Braided Cowl Pattern online. Crochet Dreamz is the creative blog of a stay-at-home mom who wanted a way to share her crochet dreams with others. Visit Crochet Dreamz for more free patterns, as well as a lovely series of baby crochet patterns and women’s wear patterns for sale at reasonable prices.